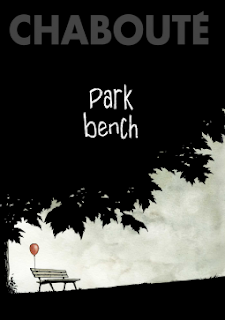 Christopher Chabouté's Park Bench is a quiet, meditative graphic novel centered around - you guessed it- a park bench. A unique approach to graphic narrative, the story at the center of Park Bench is told entirely without written dialogue. Instead, the reader bears witness to the peculiar rhythms of life for a rotating cast of characters: the marginalized, the retired, the reckless, the quiet, all interacting in the liminal spaces of both the comic panel and the park depicted therein. The lack of dialogue gives a definitively cinematic and voyeuristic sensibility to the story - the reader feels at once immersed in its world, and distinctly outside of it, unable to be fully absorbed. The effect is also one in which the reader is writing the story themselves, being guided by the images on the page, all culminating in a satisfying - but not entirely dramatic - conclusion. Park Bench is a graphic exploration of the concept of sonder - "the realization that each random passerby is living a life as vivid and complex as your own". It's a fun, heartfelt, and quietly moving journey into the concepts of space and stranger - and how we understand them as part of ourselves. Thank you to NetGalley for giving me a copy of this book in exchange for review. Canadian bookworm, writer, and Shakespeare fangirl. Tiffany has read 1 book toward her goal of 100 books.